Storefront’s current exhibition Subculture: Microbial Metrics and the Multi-Species City brings together work in biology, data science, material science to to reframe the value of microbial communities found in urban spaces. As an active laboratory for metagenomic sequencing, the gallery space explores the invisible ecologies and genetic landscapes of the built environment through the practice and study of genetic material collected directly from environmental samples across New York City. On two Fridays this fall, the laboratory will be active and open to all to view. Dr. Elizabeth Hénaff, a computational biologist and one of the exhibition collaborators, will conduct the second and third rounds of DNA sequencing as part of the ongoing experiment. Stop by at any point during these two Fridays to learn more about the process from Dr. Hénaff and Storefront’s staff. RSVP required. Capacity capped at 20. If you are interested in attending, please email subculture@storefrontnews.org with a brief statement about your relevant interests and background. What is the DNA of the city? Utilizing technological innovations of web-based, open source, and small-scale genetic sequencing devices, it is possible to collect, extract, sequence, and analyze microbial life of our immediate environments through novel and rapidly evolving techniques. Bioinformatics for Environmental Metagenomics 101: Introduction to DNA Sequencing and Analysis, led by Dr. Elizabeth Hénaff, provides an introduction to the molecular structure of DNA through the basics of transcription and translation. Participants will learn about the current methods of “reading” sequences through the use of both short- and long- read DNA sequencing technologies. Using a sample dataset that includes metagenomic data from Subculture, participants will employ online tools to perform sequence alignments and searches, gaining an understanding of the applications and interpretations of this data for environmental metagenomics. As as part of Subculture (and for use in this workshop), genetic material has been extracted from the bio-receptive wooden tiles installed on Storefront’s façade for analysis and interpretation. The materials, exposed directly to their environments, undergo a process designed to indicate the metabolic functions of the geographically-specific microbiome found on Kenmare Street. 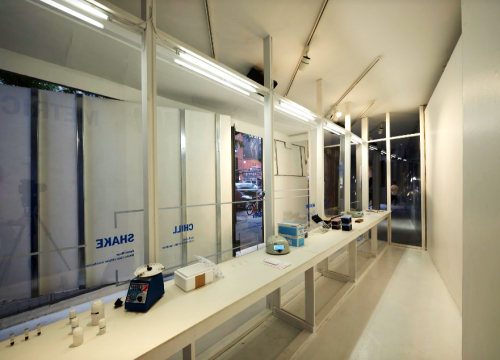 In this 101 workshop, participants will have the opportunity learn about the underlying principles and processes of the ongoing experiment at Storefront. Interrogation Series: Across Scales and Species will follow Bioinformatics for Environmental Metagenomics 101; for more information, see HERE. – Laptop computer with a web browser. Tablet use is possible but not recommended. RSVP required. Capacity capped at 10. If you are interested in attending please email subculture@storefrontnews.org with a brief statement about your relevant interests and background. We are increasingly aware of the invisible and ubiquitous microbial component of our lives – in and on our bodies and in our environments. But, how do we actually measure these? What if we want to determine which bacteria are living around us? In Bioinformatics for Environmental Metagenomics 202: Interpreting the Microbiome for Design, participants will learn the methods for identifying microbial species with DNA sequencing data, understand their functions, and explore their implications for urban design decisions. The workshop will utilize the dataset acquired for Subculture: Microbial Metrics and the Multi-Species City. Participants will learn about file formats used for sequencing data and how to manipulate them, and will gain hands-on experience with computational tools used to identify bacterial species, their genes, and methods for visualizing the results that are generated. – Laptop computer with a UNIX-based operating system. Tablet use is not possible.